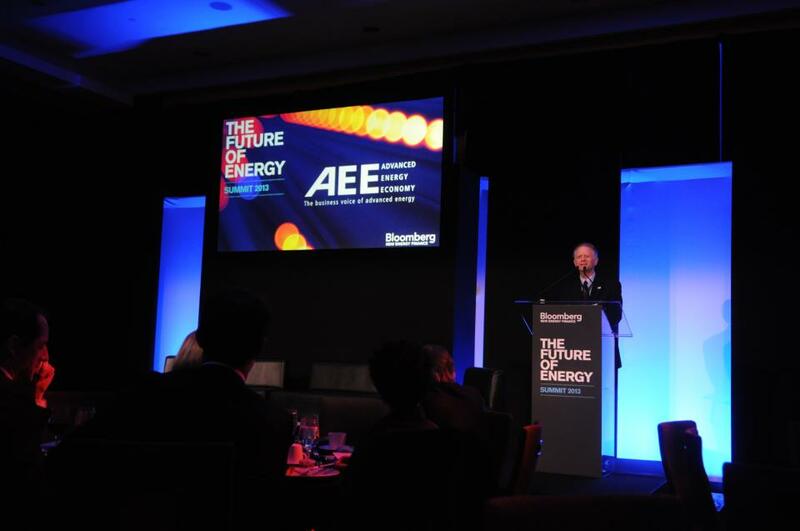 AEE was proud to sponsor the Bloomberg New Energy Finance Summit on April 22-24 in NYC. During the Summit, our blog featured several guest posts from fellow sponsors and other advanced energy companies, including Lockheed Martin discussing intelligent microgrids, an opinion post from IBM's global policy director looking at how innovation and regulation can work together, and member company EnerNOC's CEO and AEE board member Tim Healy on making energy data actionable. The Summit brought together global energy leaders from entrepreneurs to analysts to financial forecasters. Our own CEO Graham Richard opened the session on Day 3, discussing advanced energy's ability to make the world’s energy systems more resilient, while also providing return on investment, following a video message from AEE co-founder Tom Steyer. Richard also introduced the newly named Acting Secretary of Energy, Dan Poneman, who pointed out that "life is too short to be working on second class problems." Senator Lisa Murkowski, ranking Republican member of the U.S. Senate Committee on Energy and Natural Resources, gave a global keynote in which she addressed the need for an "all-of-the-above" energy strategy, including an energy security trust funded by leases and royalties from oil and gas extraction. Her discussion of energy that is "affordable, abundant, clean, diverse, and secure" aligns well with AEE's mission of promoting energy that is secure, clean, and affordable. Later, AEE had the opportunity to host a private meeting with the senator and top Summit sponsors, including Lockheed Martin, Ernst & Young, and Bank of America Merrill Lynch, to discuss federal energy policies. The panel on U.S. Competitiveness featured former Colorado Governor Bill Ritter and former New Mexico Governor and U.S. Secretary of Energy Bill Richardson. For a virtual play-by-play on AEE's involvement in the Summit, check this Storify compilation.